How do you guarantee that your products meet quality demands and comply with regulations? Through validation of your processes, equipment and software. Risk-based validation is the adequate method to prove your product is correctly prepared, packaged, labelled and transported. That’s why each quality control process in the life sciences, healthcare and cosmetics industries needs to contain a certain validation aspect. QbD offers an extensive range of validation services. Organisations often struggle to find a balance between being compliant and drowning in a costly and time-consuming venture. That’s why we implemented a risk-based validation approach in all our validation services. This pragmatic approach – based on industry best practices like Science Based Risk Management (GAMP 5 ® (ISPE)) – helps to focus on product quality and patient safety, while it reduces the cost of validation. In other words, it focuses on what really matters. There are no golden rules when it comes to exact methods for validation. Each company deals with legal compliance in its own way. QbD supports every validation process with customised services based on international regulations (including GMP, GDP and GLP guidelines, Eudralex, 21CFR part 11 and ISO 9001) and methodologies (including GAMP, LSV, CSV, TMap and ITIL). Our validation experts have the risk-based validation approach built into their genes. Thanks to a combination of best practices, extensive knowledge of processes and close collaboration with your team, they work in an efficient and well-structured way. The result? You save time, increase efficiency and lower your total compliance costs. GAMP can be regarded as a structured and project-based approach for the validation of (automated) systems. Currently, version 5 of GAMP (GAMP 5) has a definitive status, with no version 6 in the pipeline. Compared to previous versions, the emphasis of GAMP 5 is more on risk control and quality management. Discover more on validation of mobile applications and devices. Read our whitepaper ‘Mobile applications and compliancy: what you should know’. Equipment validation ensures your equipment consistently produces a result that meets its predetermined and required specifications. Equipment validation is a time-consuming process, but we have an extensive range of validation services to guarantee optimal compliance. Process validation is crucial to confirm that your process delivers consistent, high-quality products, complying with all the required quality standards. 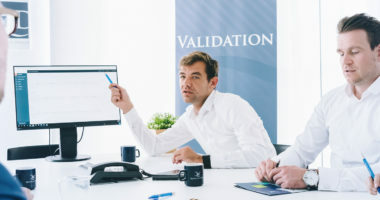 Our validation experts set up, improve and support your process validation and help you optimise product quality and minimise compliancy costs.